On looking over photographs representing horses of the present day, and comparing them with the old prints of sporting celebrities, one is forcibly struck by the sameness and lack of character in the modern work, in which as a rule the horse is standing in a conventional attitude. Of course, the camera lens draws true to life, although the photographer can alter that ” truth ” considerably, giving prominence to good qualities, and hiding any bad points. I have, for instance, taken four consecutive snapshots of a horse from various positions, the result being four totally different animals ; and this is one reason why I think the old prints, although open to criticism in some respects, give one a better idea of the horse portrayed than any modern photograph. 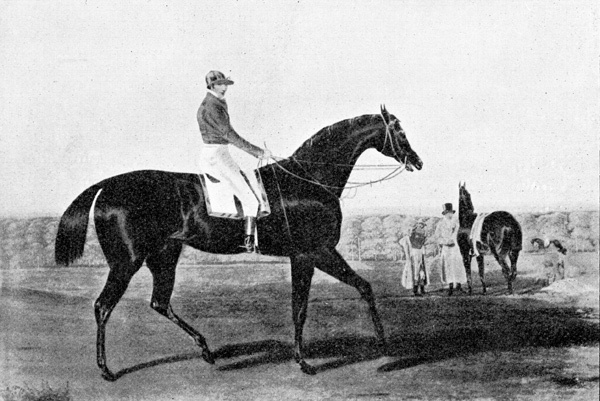 It is with the kind assistance of Mr. S. B. Darby, of Rugby, a well-known connoisseur of old prints, that I have been able to write this article, as he knows the history of every horse and jockey down to the more minute details. 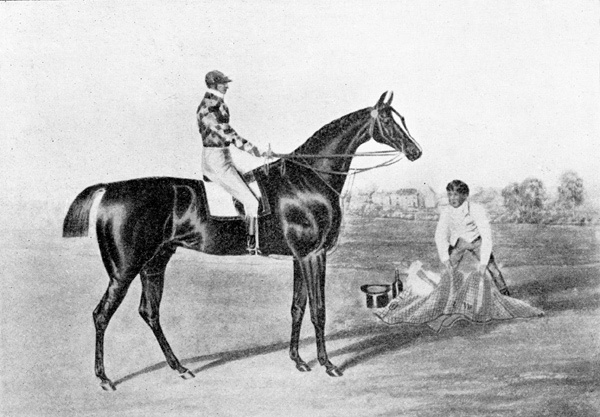 It is interesting to compare the old type of St. Leger winners with some of those one sees now contending for our big events, and to speculate on what the Chifneys, Bill Scott, Ben Smith, and others would have thought of the fashionable American seat, when they rode so long that they hardly seemed to rise in the saddle ! Chifney senior, at any rate, had a good opinion of himself, and at the youthful age of eighteen said that he ” could ride horses in a better manner in a race to beat others than any person I ever knew in my time, ” and probably few differed from his opinion. The jockeys then were apparently not particular in their get-up, which is described as peg-tops, brown breeches, white stockings, and short gaiters. Chifney also sported a ruffle and frill whenever he ‘took silk,’ while love-locks hung on each side beneath his jockey’s cap. Are there many men now who could rival Ben Smith’s pluck and loyalty when, a horse having broken his leg with a kick, he refused to dismount, and won the race, as he deserved, on the Duke of Hamilton’s Ironsides. Endless are the anecdotes about these jockeys, their gameness and endurance. Frank Buckle thought nothing of hacking ninety-two miles to Newmarket and back to ride trials. It would be a lengthy proceeding to give an account of all Herring’s works. He was at one time a well-known coachman of the London and York Highflyer, but he gave up the reins for the paint brush, and his first study in anatomy was the fractured leg of Spartan. His series of St. Leger winners began in 1815, but they were copied with slight alteration from other artists’ paintings. 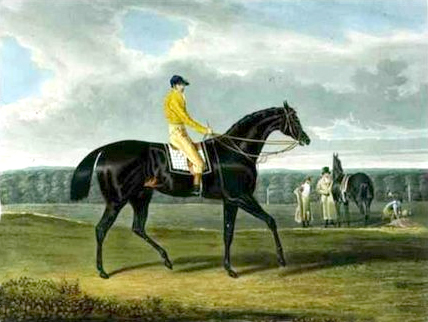 Thus his portrait of ‘Filho da Puta’ was evidently taken from Ben Marshall’s fine mezzotint of this horse and Sir Joshua on Newmarket Heath before the great match. ‘Filho’ is described as 16 hands, fine-tempered, leggy, and near- sighted, and he is depicted with coarse hocks, which a noted veterinary surgeon once told Mr. Darby were inherited in the shape of spavins by nearly all his stock, which in those times meant good business for the firing irons. Filho’s St. Leger was a remarkable one, from the fact that at the close of the betting the first four horses were exactly placed. Croft was very confident of winning, and his owner. Sir William Maxwell, in the exuberance of his spirits, smashed all the pier glasses at the “Reindeer” and “longed in his rapture for more.” An amusing story is also related about the colt’s name, which was a puzzler to two youths, one of whom backed ‘Filler’, and the other ‘Pewter’, and when the winner’s name was shouted there ensued a battle royal, each claiming to have won, until the police interfered and explained. Before the match with Sir Joshua, Croft, owing to ill-health, asked John Scott to take charge of the Northern crack, and the latter, true to his methods, wanted to run the horse rather above himself. Unfortunately Croft, when he came to Newmarket, thought the colt had not done enough work, and sent him along again, which, as John remarked, ” cooked him.” The horse lost some lengths at the start by rearing up, and could never quite catch ‘Sir Joshua’ ; but the match was the making of Scott, as Mr. Houldsworth bought Filho for 3,000 guineas, and took the young trainer with him to Mansfield. 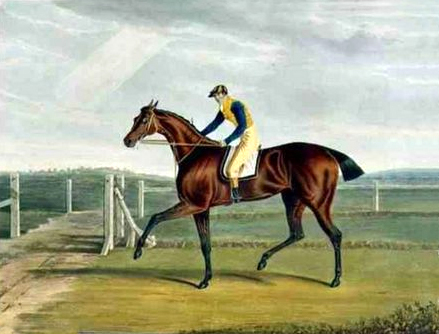 The first horse that Herring painted from life was ‘Jack Spigot’, winner of the St. Leger in 1821. He was a grand foal, but his dam took to galloping in the paddock, so Mr. Powlett got a tenant to allow his mare to bring up the colt, and wanted to christen it “Jack Faucet,” after the farmer. The latter objected, however, on the ground that it was certain to win the Leger. “Well, John” said Mr.Powlett,”a Faucet’s nothing without a Spigot,” so Jack Spigot the colt became. After the race the colt took such a dislike to Bill Scott that he would never let him come near him again, and went quite mad even if he heard his voice. 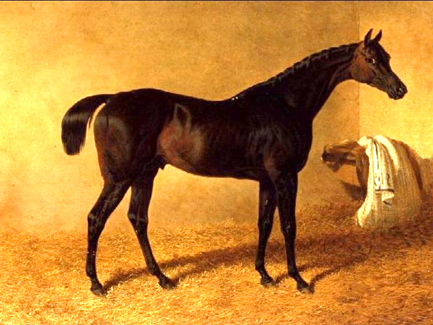 The first ten horses that Herring painted, from Filho to Jerry, in 1824, were published by Sheardown & Son, of Doncaster, and the artist is supposed to have superintended the colouring. Only a limited number were printed for subscribers, and they were brought out in atlas folio, engraved by Sutherland. 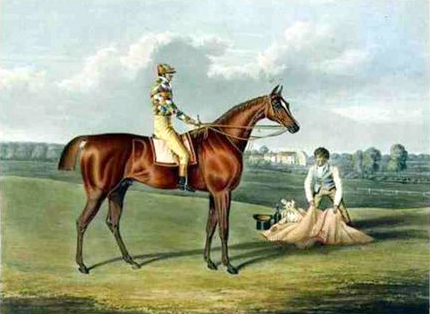 From 1825 Herring painted the winners of the Derby and St. Leger for Fuller & Son, who published them each year down to the middle of the forties. The subscribers’ prints have a Minerva’s head stamped on the margin. 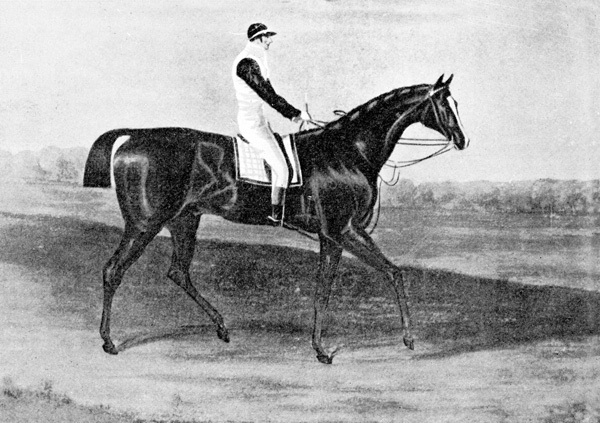 Herring also painted a series of stud horses, Lord Egremont’s ‘Gohanna’ being the first ; and a few Oaks winners by the same artist were published by Moore. 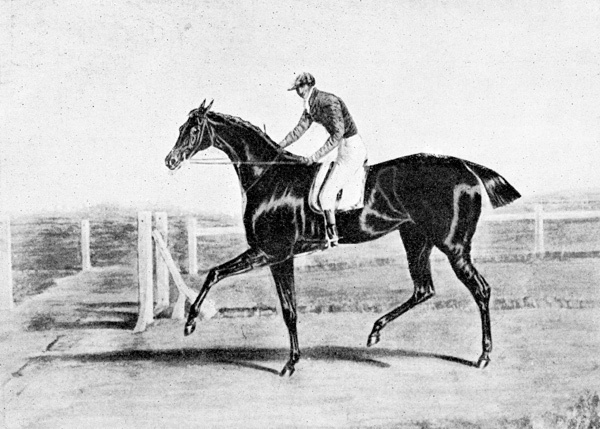 At a later period Fores published some prints of racers and stud horses. Unfortunately, many of the old prints have lost some of their value by having been mounted on linen and varnished in the days when glass, I believe, was expensive. Herring never flattered his horses, and, if anything, rather exaggerated their faults. In his pictures. ‘Barefoot’ and ‘Ebor’ are too long in the back ; ‘Reveller’ looks more the type of a harness horse; ‘Launcelot’, Bill Scott up, with a strong double bridle, is more the style of a Leicestershire weight-carrier than a St. Leger winner. This horse had enormous speed, and pulled even harder than his brother ‘Touchstone’, with his head right into his chest, and hardly anyone could hold him. ‘Jerry’ and ‘Matilda’ resemble polo ponies ; and, as a matter of fact, the latter was only 14.1&#189 hands when she was taken up as a yearling. John Day described her when first foaled as looking ” about the size of a buck rabbit, with a black-list stripe down its back.” She was the first of Mr. Petre’s memorable St. Leger trio. Lord Jersey watched Herring painting Bay Middleton’s portrait, and remarked on the length of the horse’s head. “Yes, my lord,” replied Herring, “if he hadn’t had so long a head, you would not have had so long a horse.” In ‘Bay Middleton’ three heads exactly measured his length, and according to this artist the rule of three heads worked out 99 times out of 100; but as far as I can remember from my student days in Paris, a horse’s length generally worked out at about 2&#190 heads, and a well-made horse would stand in a square, i.e. equal height and length. 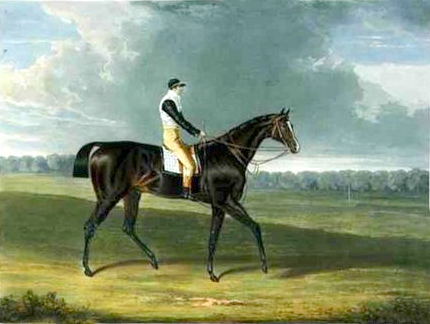 Perhaps of all his portraits his chef d’oeuvre is ‘The Duchess’, a beautiful bay mare with black points. Ben Smith is up in Sir B. Graham’s colours – yellow, blue sleeves, blue and yellow striped cap. 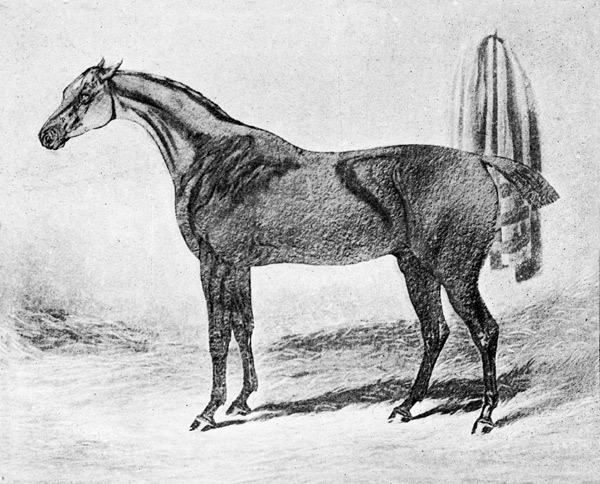 This mare won the St. Leger in 1816. 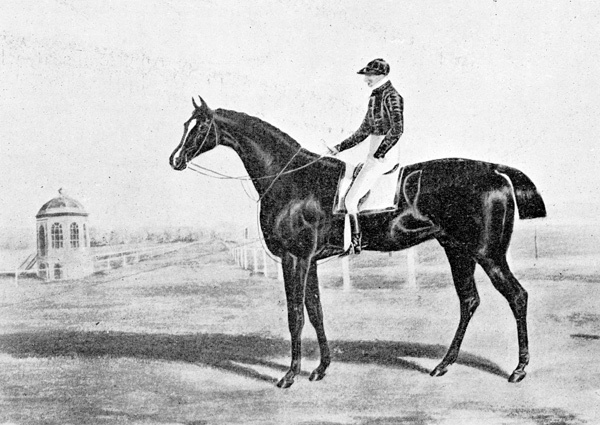 Almost equally fine are some of his Derby winners, and ‘Queen of Trumps’ and ‘Crucifix’, the latter described as very narrow in the chest, and suffering perpetually from speedy cut. The harlequin colours of Mr. Watts were frequently to the fore; amongst others he owned ‘Altisidore’, ‘Blacklock’, ‘Barefoot’, and ‘Rockingham’. 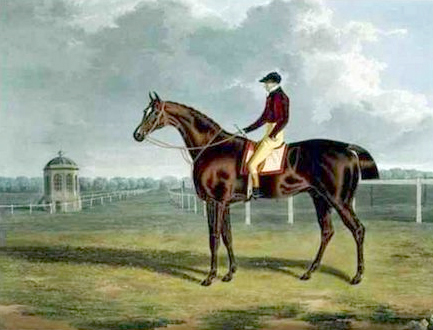 One of the rarest coloured mezzotints is of the celebrated ‘Doctor Syntax’, who won for his owner, Mr. Riddell, over twenty gold cups and plates. The ” Doctor,” as they called him in the North, was barely 15 h., mouse-coloured, with such a velvety coat that people used to say he had no hair except on his mane and tail. A slight canter would bring out the veins in a network. From a two-year-old he never would stand the touch of whip or spur, but Bob Johnson could get every ounce out of him by merely stroking and talking to him. Like his daughter ‘Beeswing’, he did not care to carry more than 8 stone 11 lb (55.8 kg). He won the Gold Cup at Preston for seven years in succession, and the Guild made so certain that he would win it the eighth time that they had prepared gilt shoes and a procession in his honour. Unluckily he was only able to divide ‘Reveller’ and ‘Jack Spigot’. These illustrations are copied from some of the old prints that are occasionally passing through Mr. Darby’s hands. Unfortunately they give no idea of the colouring, which in the originals is wonderfully fine and clear and very true to detail ; the tints are a harmony in tone, mellowed with age, whereas the reproductions are crude in colour, and of course the old plates are very much worn, and the reproductions have not the same finished detail. The old coloured prints in good preservation are worth from £7 to £10 each, and the uncoloured prints from £3 to £4 ; this, of course, means on Whatman’s paper with watermark and date, untrimmed margins and full reading titles. Two sons: William Chifney, born at Newmarket in 1784, was all his life engaged in the care of racehorses in the neighbourhood of Newmarket. Samuel Chifney, was born in 1786. He first rode for the Prince of Wales at the Stockbridge meeting in 1802. He continued the slack-rein system inaugurated by his father, and during his career ‘the Chifney rush’ passed into a proverb.